In 2013, the Daily Business Review recognized some of the best work delivered by lawyers from Miami-Dade, Broward and Palm Beach counties in their annual edition of Most Effective Lawyers in South Florida. The DBR selected more than 80 attorneys in 12 different practice areas, which included Appellate, Arbitration and Mediation, Bankruptcy, Business and Complex Litigation, Corporate Securities, Criminal, Distressed Real Estate, Personal Injury, Pro Bono, Product Liability, Public Interest and Real Estate. Each attorney was measured on one critical benchmark: the results for the client. The nominees’ work was evaluated by the DBR editorial staff and based on tangible results, the degree of involvement in bringing about those results and the impact on public policy and business interests. The DBR editors conducted a three-month selection process that focused on not only the outcomes, but the complexity of the cases. The DBR’s research director reached out to many of the nominees for information; then selected the semifinalists and ultimately the finalists. 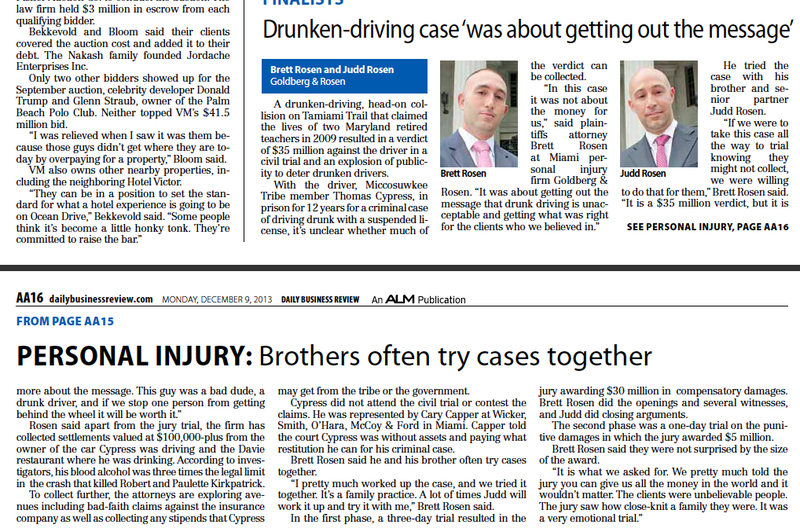 Goldberg & Rosen P.A., Partners and Brothers, Brett and Judd Rosen were selected upon 12 other attorneys as finalist for being the 2013 Most Effective Lawyers in the Personal Injury category. This honorable distinctions can be read in greater detail in the below article.